CounterSpy detects, deletes and protects! CounterSpy has Active Protection. You could call it a "spy-wall." 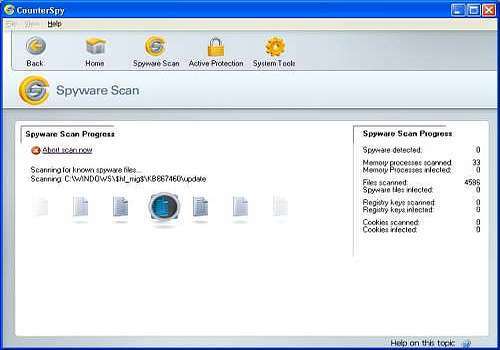 There are "checkpoints" that are monitored in real-time for attempts to install spyware. A very high percentage will be blocked by CounterSpy. Just like the early days of viruses, spyware is quickly becoming an increasing threat to both individual and corporate computer users. Spyware does more than just steal information about your computing habits. It slows down your PC and might break it so badly you cannot even get on the Internet any more. This page tells you about the stand-alone version of CounterSpy for consumers. But there is also an enterprise edition.